Before we get to this month’s concerts, I’d like to wade in on the world music component of Canada’s music industry awards, the JUNOs. Held from March 26 to April 1 in Ottawa, this year’s JUNOs have 41 award categories encompassing nominations of the top-selling singers and musicians you would expect such as Arcade Fire, Avril Lavigne, Drake, Justin Bieber, Michael Bublé and Nickelback. The “World Music Album” category nominations reflect more modest album sales, but no less artistic ambition and achievement. Among the distinguished performers represented is previous JUNO award-winner Kiran Ahluwalia. Her latest album Aam Zameen: Common Ground fuses her own ghazal and Punjabi folk-song approach with the music of the African masters of Malian “desert blues.” Montreal based artist Socalled has had a shorter career, yet his latest music, impossible to pigeon-hole, is no less ambitious in its transnationality. His musical mission appears to cross all sorts of musical and media boundaries, all the while embracing a kibitzing attitude toward sound collage inspired by pop, funk, klezmer and rap. Another nominee is the Brazilian-born singer, percussionist and composer Aline Morales, represented by her debut solo album Flores, Tambores e Amores. Her music assays Brazilian song styles such as samba, forró and 1960s tropicalia, and forges them into her own voice with traces of Italian film soundtracks, avant-garde poetry, African percussion and vintage synths. Now to the month’s live offerings: examining world music in a living historical context on March 1, the Royal Conservatory’s String and World Series at Koerner Hall presents the multi-Grammy Award-nominated viola da gambist, Jordi Savall, directing two groups, Hespérion XXI and the Tembembe Ensamble Continuo. The Catalan virtuoso of the viola da gamba, “an instrument so refined that it takes us to the very brink of silence,” Savall has been among the world’s major figures in early music since the 1970s. He is partly responsible for bringing the viola da gamba back onto the world stage. While his typical repertory ranges from the mediaeval to the baroque period, Savall’s approach to interpreting this “dead” historical repertoire has always been informed by the performance practices of living oral music traditions of Europe, the Arab world and now the “New” world. Appointed European Union ambassador for intercultural dialogue in 2008, Savall is passionate about asserting the common roots of human expression. The Koerner Hall concert is titled “Folias Antiguas & Criollas: From the Ancient to the New World.” It features Spanish and Mexican baroque music as well as performances from the living Mexican Huasteca and Jarocho music traditions: Savall explores the creole music created from their confluence. You can catch the programme March 2 at the Perimeter Institute in Waterloo if you miss it at Toronto’s Koerner Hall. No less challenging to the music landscape status quo is the March 5 CD launch concert, “Bridges: Jewish and Arabic Music in Dialogue” at the Al Green Theatre, Miles Nadal jcc. Headlining are Lenka Lichtenberg, the Jewish singer with an international career, and Middle Eastern-Canadian singer, dancer, actor and qanun player Roula Said. For over 20 years the inspiring Said has been one of Toronto’s leading lights in the belly dance, Arabic and fusion music scenes. While Lichtenberg was born and raised in Prague, she completed her university music education in Canada. Her current music reflects her Yiddish roots and her ongoing study of the Jewish cantorial tradition; in her extensive touring, she pursues a career as a singer-songwriter. Together, their aim with “Bridges” is to establish an inspiring dialogue between Jewish and Arabic cultures grounded on musical commonalities. 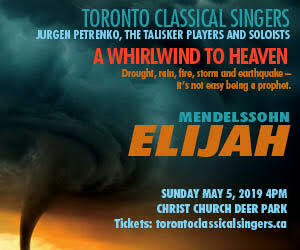 They are supported in their quest by an outstanding backup band composed of a Toronto world musician “A-team,” including John Gzowski on oud, guitars and bouzouki, Kinneret Sagee on clarinet and Ernie Tollar on sax, flutes and clarinet. The rhythm section consists of bassist Chris Gartner, percussionist Alan Hetherington and Ravi Naimpally on tabla and dumbek, all of whom performed with convincing élan on Lichtenberg’s sparkling last album Fray, markedly influenced by Toronto’s interactive world music scene. On March 2 the Toronto-born chanteuse Alejandra Ribera performs at the Glenn Gould Studio. Her dramatic singing and genre-hopping eclectic repertoire draws on both her Argentinean and British heritage, and particularly mirrors the grit and magic of Ribera’s everyday urban Canadian reality with its darkly lyrical themes. The Amadeus Choir, directed by Lydia Adams, presents “A Celtic Celebration,” March 3, at Toronto’s Jubilee United Church. The 115-voice veteran choir is joined by Stratford’s five-piece, pan-Celtic fusion band Rant Maggie Rant, led by multi-instrumentalist Mark Fletcher. The Highland dancers also on the bill will undoubtedly further animate the concert. The Royal Conservatory’s World Series presents two outstanding singers early in March. On March 7, in a multi-media presentation, the Latin Grammy award winning Lila Downs will perform her dramatic and highly unique reinvention of traditional Mexican music and original compositions fused with blues, jazz, soul, African root and even klezmer music. And on March 10, it’s another Grammy Award winner’s turn: the powerful-voiced Angélique Kidjo performing her brand of Afro-funk fusion with an infectious joie de vivre. Dubbed “Africa’s premier diva” by TIME magazine, the West African born Kidjo has been an active member of the international world music scene for over 20 years. Her list of illustrious collaborators including Bono, Carlos Santana, Peter Gabriel, Alicia Keys and Branford Marsalis, gives an idea of the force of her personality and the significant impact of her vocal accomplishments. This month, two of our universities showcase the wide-ranging world music activities of their music students and faculty. I’ve found these concerts are a particularly good way to sample a musical tradition new to me: they’re relaxed, the youthful participants are charged with the enthusiasm of new converts — plus they’re free. On March 15, from noon to 8pm, York University’s Department of Music presents day one of its “World Music Festival.” Performances by the World Music Chorus, Celtic, Ghanaian, Cuban, Klezmer ensembles and the Escola de Samba will fill the halls and rooms of the Accolade East Building with global sounds. The festival continues all next day with Caribbean, Chinese, Korean Drum, Balkan Music, Flamenco and Middle Eastern ensembles. Then on March 19, York’s World@Noon series presents the triple platinum, Israeli singer-songwriter Idan Raichel at the Tribute Communities Recital Hall, Accolade East Building. His “Idan Raichel Project” is distinguished by its fusion of Hebrew lyrics, Middle Eastern and Ethiopian music and electronica. The University of Toronto Faculty of Music presents its own World Music ensembles in concert March 16 and 21 at the MacMillan Theatre, Edward Johnson Building. On March 28, at Walter Hall, the exemplary Vocal Jazz Ensemble is directed in concert by the inspired extended vocalist, conductor and teacher Christine Duncan. They will perform with their guest, Darbazi, our region’s first and most accomplished Georgian polyphonic choir. There was a time in the early 1990s when the guitar duo Strunz & Farah virtually defined the emerging world music market. Their very successful albums won Billboard’s World Music Album of the Year and a Grammy nomination. With an eclectic sound that has been described as world fusion, their music is a mediated reflection of their cultural roots, including Afro-Caribbean, Latin American folk, flamenco and Middle Eastern music, wrapping it all up in jazz-based improvisation. They’re back on the road appearing in venues across Southern Ontario this month. Starting at Hugh’s Room in Toronto, March 14, they then appear at the Capitol Theatre in Port Hope, the Molsen Canadian Studio at Hamilton Place, London’s Aeolian Hall and at Market Hall in Peterborough, on March 15, 16, 17 and 18, respectively. Finally, rounding out the month, on March 31 the Royal Conservatory presents “Intercultural Journeys,” echoing the intercultural and peace-bridging function of music proposed by some of the other concerts noted this month. Israeli cellist Udi Bar-David leads a group consisting of Lebanese violinist Hanna Khoury and Palestinian percussionist Hafez Ali, digging into repertoire merging European and Arabic classical musics. Their guests, Syrian singer Youssef Kassab, cantor Beny Maissner and Toronto qanun master George Sawa, will add yet more inclusive notes to this cross-cultural concert. The collective of black artists (COBA) kicks off Black History Month with a concert titled “Les Rythmes de la Forêt,” running from February 3 to 5, at the Fleck Dance Theatre, Harbourfront Centre. Founded 19 years ago, COBA has been at the local forefront of the creation and production of stage works that reflect Africanist social themes and perspectives. Using storytelling, music and drama interwoven with dance, the programme presents a suite of dances from sub-Saharan Africa accompanied by traditional drumming and singing. The production aims to represent social and ritual events in peoples’ lives including rites of passage, initiations, harvest, and moments of joy and celebration. Harbourfront Centre itself joins in celebrating the African experience in its Kuumba festival by exploring “African roots through a 21st-century perspective.” This year the festival highlights the essential role women have played in shaping Black culture. For three days, February 3 to 5, the festival offers storytelling, fashion, film, dance, round table discussions, food, exhibitions, workshops (some musical) and children’s activities. And, of course, concerts. LATIN GUITAR: Playing the February Valentine card, Latin guitarist Johannes Linstead and his group join forces with flamenco guitarist Antonitas D’Havila in a concert titled “Valentine Fiesta Romantica.” The “romance and Latin passion” will be on display on February 8 at Coconuts Restaurant & Lounge Night Club and again on February 10 at the Latin Fever Night Club. Johannes Linstead, awarded the title of Canada’s Guitarist of the Year, has earned international recognition for his best selling albums in the instrumental and world music sales categories. His partner on the bill, Antonitas D’Havila, is a renowned Romany flamenco guitarist, specializing in an intense, bravura style. If you miss those concerts you can still redeem your Valentine mojo with your beloved a few days later when D’Havila performs at the Trinity-St. Paul’s Church, on February 17. YASMIN: On February 11, the Royal Conservatory presents a concert by Yasmin Levy and Omar Faruk Tekbilek at Koerner Hall. The headliner is the Israeli Ladino (Judeo-Spanish) singer Yasmin Levy who has won high praise for her vocalism that also engages the fiery heart of flamenco. Songlines wrote, “every colour and pitch in her remarkable range and the resulting vocal pyrotechnics are unforgettable.” The brilliant Turkish born multi-instrumentalist Omar Faruk Tekbilek’s 40-year career has taken him on a global journey. His nonstop recording and touring activities place him among a small cohort of pioneer “world musicians.” I performed with Omar years ago, but distinctly recall the intimate bond he wove with the audience in his solo spot. The RC’s Middle Eastern Music Series resumes the next day, (February 12), 3pm, at the Mazzoleni Concert Hall, with composer and pianist Malek Jandali in a programme inspired by the folk and ancient music of Syria, incorporating both Arabic and Western musical elements. The music on his new CD Echoes from Ugarit, featured on this concert, is arguably the most ancient “world music” in my column this month. It is inspired by the oldest known music notation in the world, dating to the fourth century BCE, discovered in the ancient Syrian city of Ugarit. BATUKI: On Saturday February 11, the Batuki Music Society continues this month’s Black History theme with its “Ethiopia: A Musical Perspective” at the CBC’s Glenn Gould Studio, an ambitious expedition into Ethiopia’s musical culture starting from the music of the Azmaris, professional bards who recite stories and comment on social issues through song, moving on to varied pentatonic regional musical genres, and ending with Ethio-jazz, an exciting modern hybrid. Ethiopia, the only country on the African continent never colonized by Europeans, has a long and illustrious history. What better place than Toronto, with the largest Ethiopian population in Canada, to showcase the various musical instruments and wealth of Ethiopian expression? The musicians taking the audience on this deep journey include Girma Wolde Michael, Fantahun Shewankochew, Henok Abebe, Martha Ashagari and Gezahegn Mamo. CONVERGENCE: Setting our sights beyond the GTA, on February 16 the University of Guelph presents the culturally diverse Convergence Ensemble with Gerard Yun playing shakuhachi, didgeridoo, and native flute, Kathryn Ladano on bass clarinet, and pianist Sandro Manzon. SOWETO GOSPEL: Back downtown at the Sony Centre for the Performing Arts, the inspirational two-time Grammy and Emmy Award-winning Soweto Gospel Choir returns on February 24 and 25. With a new show titled “African Grace,” the Choir’s 24 singers, dancers and musicians will heat up the dreariness of late February with their joy-filled repertoire. PAVLO: Also on February 24, multi-award winning Greek-Canadian musician and composer Pavlo performs at Roy Thomson Hall. Billed as the local stop on the Six String Blvd World Tour, the evening will appeal to the legions of fans who have made Pavlo the “most successful independent artist to come out of Canada, performing 150+ shows per year,” according to his website. On his ninth album, Six String Blvd, Pavlo has gone global inviting “the world’s most exotic instruments into his classic Mediterranean sound.” Presumably the ney, erhu, bouzouki and sitar on his CD will be there. SEPHARDIC DIASPORA: March 1 the York University Department of Music’s World at Noon concert series features “Songs and ballads of the Sephardic Diaspora” by a leading specialist in that repertoire, singer Judith Cohen. It’s at the casual Martin Family Lounge, 219 Accolade East Building. MUSIDEUM: The new Coffeehouse Concert Series at the low-keyed and intimate downtown venue/retail store Musideum keeps surprising us. Its delightfully eclectic programming continues with a world music spin on March 3 with the group Medicine Wheel, “bringing together a world fusion of music for the soul.” Leader David R. Maracle on native flutes and hang drum is joined by Donald Quan on guzheng, keyboards and tabla, and guitarist Ron Bankley. Percussionists Richard Best and Rakesh Tewari add the metric frame, propulsive energy and accents. What Is The “World” In This Music? What is “World Music” and who are its performers? For years I have been alternately intrigued by the question or flatly dismissed it as irrelevant to the music I loved and made myself. Now that I’ve served as your faithful world music columnist for some months, however, I thought I’d use this end of year soapbox to finally tackle this slippery musical subject. Please brace yourself for a further series of annoying questions arising from my simple initial one. The woods get much thicker before we can clearly see the trees, let alone the clearing beyond. Is world music a commercial marketing category, coined by record label executives in 1980s London, equipped with its own sales charts, radio category, journalistic terminology and record awards? Or a term coined in the early 1960s by the late ethnomusicologist Robert E. Brown at Wesleyan University, Connecticut for his groundbreaking world music studio and academic programs there, which became a model for universities, colleges and conservatories around the world? Is it “local music from out there,” or “someone else’s local music” as some have proposed? Is it about “our” vs. “their” music, or about the way musicians variously recombine the music you were born into with the music you chose, moved into? Or is it a musical football match playing out a disagreement between perceived authenticity (i.e. indigenous music) and hybridized musical categories, especially those seemingly “diluted” by pop culture? In the face of such a bewildering range of questions, just what can we agree on? One thing, perhaps, is that the definitions of world music are multiple, dynamic and overlapping. Another is that over the last 30 years world music has clearly gone through a process of gradually increasing “sub-genrefication,” not unlike other kinds of music (heavy metal is a good example). By sub-genrefication I mean an extension of the genre’s original definition of a perceived unmediated “roots music” to include a mounting list of newly created hybrid sub-genres. Part of this process is no doubt the result of pressures on genre boundaries in the overall climate of a globalising pop culture. There are commercial pressures at play here too. According to a 2002 Unesco report by the latter half of the 1990s the value of global record sales hit a historic peak. Significantly slipping sales ever since have meant the record and publishing company financial support for world music, has declined. On the one hand this has led, overall, for world music as well as for many other music categories, to a precipitous decline in overall album sales. Paradoxically it may also be directly linked to the vigour of the modest but vital local live world music performance scenes dotted around the planet, and to the touring companies who (hope they will) pack our largest halls, often wrapped up in elaborately costumed and staged extravaganzas. There are examples of both on display in my column this issue. Happily for all of us, musicians of all stripes continue to make both established and newly minted hybrid kinds of music that someone may choose to dub world music — or not. I hope I haven’t lost you in my overview of some 50 years of world music, because, as you can see from what follows, our GTA concert scene over the next two months reflects and underscores many of the issues I have mentioned. Parvaz Homay and his Mastan Ensemble present “Love, Wisdom and Human” [sic] at Roy Thomson Hall on December 2. Described as a newly created concert “opera” by Iranian musician Parvaz Homay, this production (in Farsi) is presently touring Canada and the US. Judging from this group’s multiple albums and international tour dates they seem to enjoy a sold fan base among the Iranian diaspora. At its Toronto stop, the Mastan Ensemble, a traditional Persian instrumental group, is reinforced by a Western orchestra directed by Toronto conductor Kerry Stratton. A brief trailer video on his website reveals Homay as a singer with a folksy voice. On the other hand, soprano Darya Dadvar sings in a distinctly operatic manner. The dramatic baritone, Soli, rounds out the concert cast. On December 6, the world music Christmas calendar begins in earnest with the Nathaniel Dett Chorale’s concert titled “An Indigo Christmas: Navidad Nuestra” at Koerner Hall. The artistic director, Brainerd Blyden-Taylor has programmed a vibrant mix of Afro-Latin and Andean rhythms and harmonies. The Latin music quartet, Maderaz, and the celebrated dance collective COBA will add to the choir’s celebration of Afro-centric dance, music and folkloric traditions invoking the spirit of Christmas. The concert features two choral gems by Argentinean composer Ariel Ramírez (1921–2010). His Misa Criolla (1964), now a staple of the choral repertoire, is spiritually charged and at the same time deeply rooted in multiple music/dance forms from across South America including the chacarera, carnavalito and estilo pampeano, as well as Andean influences and instruments. Here, COBA choreographer BaKari E Lindsay, COBA brings it to life through staged dance representations of the dance rhythms intrinsic to Ramírez’s score. Ramírez’s signature Yuletide Navidad Nuestra, which serves as the concert’s centrepiece, is a suite of Argentinean carols marked by characteristic Hispanic American music. The evening is rounded out by Haitian-born Sydney Guillaume’s Dominus Vobiscum interweaving Gregorian melodies with Creole texts and rhythms; a trio of African-American spirituals by Minnesota composer Robert L. Morris; an a cappella interpretation of Go Tell It On The Mountain arranged by Bruce Saylor; and Craig Courtney’s impassioned arrangement of Mary Had A Baby. Music Gallery’s concert on December 16 also has a Christmas theme, but one that reaffirms the commitment to experimentation in the Music Gallery’s “New World Series.” Titled “Asalto Navideño Reimagined: A Latin Christmas Concert,” the concert has three layers: a remix of a classic salsa Christmas album, a seasonal celebration and a resolute statement of pan-Latino culture. Originally a statement about New York Hispanic life, Willie Colon and Hector Lavoe’s popular salsa Christmas album Asalto Navideño, now 40 years old, is ripe for reinvention. Its lyrics speak of the joy of Christmas, but they also explore themes of home and diaspora and even propose new festive traditions. Today’s Latin sounds continue to mix music from across the Americas, increasingly with the intervention of electronics. Therefore it’s natural that four “producers” have been commissioned to remix the album’s now-iconic material: Toronto’s DJ Linterna & Ulladat, DJ Javier Estrada from Monterrey, MX, and Sonora Longoria from Austin, TX. All are known for their individual combinations of music genres, groove and experimentation. Their electronic contributions will be mixed with live instruments including Steve Ward on trombone and vocals. Vocalist Lido Pimienta, who splits her time between Toronto, London, Ontario, and Colombia, is a key voice in the evening; her striking hybrid performance style combining unaffected vocals and electronics. Moving into the New Year, on January 10, 2012 at noon, the Little Pear Garden Collective presents a different sort of festive entertainment, performing classical and contemporary dance works with Chinese music at the Richard Bradshaw Amphitheatre, Four Seasons Centre for the Performing Arts. The collective, directed by Emily Cheung, is Toronto’s Jingju or Peking opera company. That this concert is part of the “Dance Series: Chinese Traditions Then and Now” is yet another reminder that world music performances also sometimes include dance. At the core of Shen Yun’s performances appears to be a vast staged pageant, with tableaux enacted by dozens of performers clothed in impressive, brilliantly coloured, custom-made costumes and supported by an original musical score performed by a Western orchestra, classical Chinese and regional ethnic dance styles, instruments such as erhu and pipa, and characteristic vocalists. The show’s narrative is transparent. It moves audiences from the Himalayas to tropical lake-filled regions, “from the legends of the culture’s creation over 5,000 years ago through to the story of Falun Dafa in China today.” With over 100 artists “Shen Yu Performing Arts” might be one of the primary proponents of the “go big because you can’t go home” school of world music (and dance) performance. May you all have wonderful Holidays, a stellar 2012 and be able to go home if you want to. Before wading into the teeming waters of this month’s events, a moment’s reflection on the recognition of world music and of the general stature accorded to the arts in this town: The occasion that brought both together for me was the 2011 Mayor’s Arts Awards lunch. Presented by the Toronto Arts Foundation on Thursday October 20 at the Bay’s Arcadian Court, While this was the sixth such awards event, it was to have been Rob Ford’s first — that is, if he had chosen to attend the ceremony named after his office. But that would have meant delegating his high school football coaching duties (final game of the season you know). The mayor’s choice was not lost on the media covering the event or on the arts insiders who did attend. But his absence did surprisingly little to sour the mood, thanks in no small part to the deft emceeing of playwright, novelist and actor Ann-Marie MacDonald and a brace of earthy and soulful songs from blues singer and songwriter extraordinaire Rita Chiarelli led the proceeding with a brace of earthy and soulful songs, the second tapping her Italian roots. Then the awards rolled out. More than 300 guests had cleared their busy agendas. The enthusiastic crowd consisted of seasoned artists, politicians, business leaders, arts patrons, bureaucrats and arts media. They gathered to celebrate artists, arts administrators and supporters who have helped build Toronto’s vibrant civic and cultural life. Five awards, with cash prizes totalling more than $40,000, were presented. The Canadian Contemporary Dance Theatre (previously widely known as Canadian Childrens Dance Theatre) won the Arts for Youth Award. In her acceptance speech artistic director Deborah Lundmark praised not only the key choreographers, teachers and dancers in her company, but also composers like the late Michael Baker who contributed significantly to the company’s success. The Muriel Sherrin Award for international achievement in music went to the mrdangam and kanjira drummer, composer and York University music professor Trichy Sankaran. Indian born Sankaran has been an active fixture on the Toronto, and indeed on the global world music scene, for 40 years. He has tirelessly taught music, performed his native Carnatic classical music of South India, and has collaborated with a vast array of leading musicians from many genres. I see this award as a milestone, recognizing a lifetime of achievement. It’s also a recognition that world music has come of age in our town. Echo: spotted among the “seasoned artists” at the aforementioned Arts Awards luncheon were Allan Gasser and Becca Whitla, the organizational glue of many a true community arts venture, among them Toronto’s Echo Women’s Choir. At the beating heart of most cultures around the world is the practice of community music and dance. These are too often sidelined in the public and media gaze, however, in favour of polished staged professional presentations, the kind that appear in large venues in cities. For 20 years the Echo Women’s Choir has been “keeping it real” by cultivating songs from many places — including our own — with passion, musicianship and a small-town activist community spirit. So there’s no need to get out of town to celebrate the harvest season because on Saturday, November 5 you can do it at the heart of downtown. The Echo Women’s Choir is serving up an old-fashioned community square dance at the Church of the Holy Trinity, beside the Eaton Centre. I’ll be getting in touch with my inner square dancer as caller Lorraine Sutton guides dancers through the steps and Cape Breton fiddler Dan Macdonald and keyboardist Kate Murphy provide the essential live musical incentive. In true Echo Women’s Choir tradition, there’s more: craft activities for children, homemade preserves for sale and a gourmet home-baked pie raffle. I’m holding out for a tart and, hopefully, heritage apple pie. From November 1 through 6, Mirvish Productions presents Fela! at the Canon Theatre. Fela! is a dramatization of the story of Nigerian Afro-beat pioneer, Fela Anikulapo Kuti, whose powerful music ignited a generation; it is directed and choreographed by the Tony Award winning Bill T. Jones. Fela Kuti dedicated his life and music to the struggle for freedom and human dignity. The Broadway buzz is that this triumphant and athletic production chock full of Kuti’s propulsive music, Jones’ book and explosive choreography ends up as an inspirational evening. The Richard Bradshaw Amphitheatre, Four Seasons Centre for the Performing Arts, continues its series of free noon concerts. On November 3, Nova Bhattacharya, dancer and Ed Hanley, tabla, present a programme titled “Bharatanatyam Beat.” On November 23, “In the Shadow of the Volcano,” featuring the traditional music of southern Italy, is performed by the Vesuvius Ensemble with tenor Francesco Pellegrino. Indigenous music genres include the villanelle, tarantella, fronna and tammurriata. On November 4 at Koerner Hall, the Royal Conservatory presents star Spanish flamenco and tango singer Diego El Cigala. The show titled “Cigala & Tango” serves up an “evening when tango and flamenco join hands.” El Cigala is joined by leading Spanish and Argentine musicians. The same night at the Music Gallery, Minor Empire performs a concert co-produced by Small World Music. Minor Empire is a band with unabashed Turkish roots yet embracing the language of electro jazz. The group is manned by local musicians including Orgu Ozman, vocals; Ozan Boz and Michael Occhipinti, guitar; Chris Gartner, bass; Debashis Sinha, percussion; Ismail Hakki Fencioglu, oud; and Didem Basar, kanun. Beyond the GTA, the University of Waterloo Department of Music hosts a free noon concert on November 16 called “Honkyoku Duet.” Traditional Japanese shakuhachi solos and contemporary duets are rendered by shakuhachi master Gerard Yun and Kathryn Ladano, bass clarinet, at the peaceful Conrad Grebel University College Chapel. November 18 to 20 will be auspicious days for Nagata Shachu. The Japanese taiko group performs at the Fleck Dance Theatre, Harbourfront Centre. John Terauds noted in the Toronto Star, “It’s another credit to this cosmopolitan city that one of the world’s most interesting Japanese taiko drumming ensembles hails from Toronto.” Not only will it unveil its second DVD video, but Nagata Shachu is also premiering a new show, Hana. Rooted in the folk drumming traditions of Japan, Nagata Shachu’s principal aim is to rejuvenate this performance art by producing innovative and exciting music that speaks to today’s audiences. Its production of Hana strives to strip away the superficiality of typical concert performances and to reveal the essence of each performer to the audience through the use of many kinds of taiko, flutes, shamisen, voice, and movement. Over the past few years Gallery 345 has proven itself to be a modest venue with an ambitious programming policy. On November 18, multi-instrumentalist, singer and oud virtuoso Mel M’rabet pairs up in concert with the illustrious Cuban-Canadian pianist Hilario Duran. Mel has performed internationally with musicians such as Cesaria Evora, Steve Potts, Omar Sosa and Cheb Mami. Still at Gallery 345, the November 20 concert at 3:30pm is titled “David Lidov. Recital Number Six.” The world music aspect of the evening is in the form of the premiere of Lidov’s Obedient Ears for sulings (Indonesian bamboo ring flutes) and piano. Performers include David Lidov and William Wescott on piano, the Annex String Quartet and yours truly on sulings. On November 25, Small World Music presents Naseer Shamma & the Magnificent Strings at the Toronto Centre for the Arts, 5040 Yonge St. And plucked strings are undoubtedly what you will hear. Naseer Shamma, a renowned Iraqi oud player, is joined on stage by Pakistani sitarist Ashraf Sharif Khan and Andalusian flamenco guitarist Romero Iglesias. Judging from the next concert, it seems we’re already ramping up to the holiday season. On November 26 at 1 pm Small World Music presents “Celebrate! Holidays of the Global Village with Chris McKhool & Friends” at Trinity-St Paul’s Centre. This free multi-cultural musical mosaic includes musical guests Ernie and Maryem Tollar, Suba Sankaran, Shannon Thunderbird, Jordan Klapman, Aviva Chernick and the members of Sultans of String. My world music also includes the music of the First Nations. The University of Toronto Faculty of Music presents “World Music Visitor: Pura Fé,” in a concert of First Nations contemporary music on November 26, 7:30pm, at Walter Hall, Edward Johnson Building. The award-winning vocalist Pura Fé is a founding member of the native woman’s a capella trio, Ulali, and is recognized for bringing Native contemporary music into the mainstream. November 27, the Batuki Music Society presents Bassekou Kouyate and Ngoni Ba at the Great Hall; 1087 Queen St. W. Bassekou Kouyaté is a virtuoso musician and singer whose work overlaps West African and American roots music. The ngoni, his instrument, is a “spike lute” and considered one of the ancestors of the banjo. Deeply anchored in the griot tradition, Kouyaté has collaborated with many musicians in and outside of Mali. He was part of Taj Mahal and Toumani Diabaté’s “Kulanjan” project, as well as serving as one of the key musicians on Ali Farka Toure’s posthumous album Savane (2006). He also toured and recorded with master banjoist Bela Fleck on the Grammy winning Throw Down Your Heart. I saw them in Toronto last summer and was duly mesmerized by their music. Finally, on December 3, the Royal Conservatory’s Koerner Hall showcases famed Israeli folk singer-songwriter Chava Alberstein, acclaimed as “the most important female folk singer in Israeli history,” with over 50 albums to her credit, in a double bill with extraordinary Egyptian-Canadian vocalist Maryem Tollar. Their large band includes Oved Efrat, acoustic guitar; Eran Weitz, guitars; Avi Agababa, percussion; Waleed Abdulhamid, bass; Naghmeh Farahmand, tombak; and Michael Ibrahim, nay. Local musicians include Ernie Tollar, saxophone and flutes; Hugh Marsh, electric violin; Ian De Souza, bass; and Levon Ichkhanian, guitar. I’m expecting the Israeli-Egyptian musical forecast in Koerner Hall to be convivial and warm, even though the temperature on Bloor St. might prove rather frigid that December Saturday night.